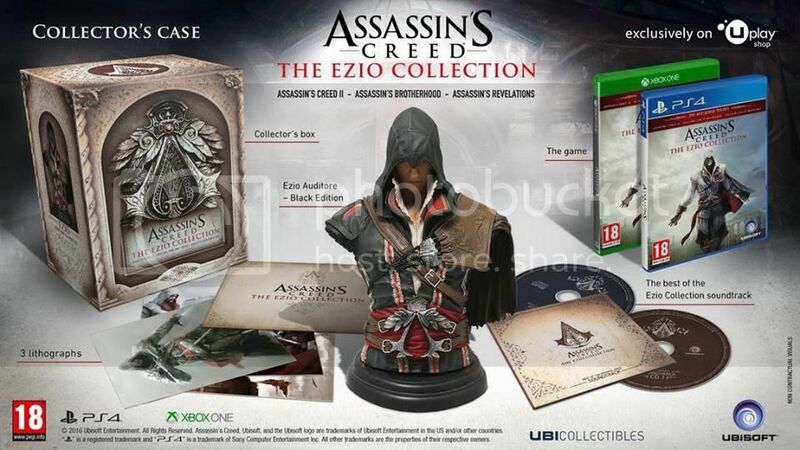 The Ezio Collection will feature the 3 Ezio games: Assassin's Creed II, Assassin's Creed Brotherhood & Assassin's Creed Revelations bundled with all Single-player DLC (No Multiplayer content) and will be enhanced for the current-gen consoles. The Ezio trilogy were some of the best games and a fully-developed plot that stretched throughout most of his lifetime. Something I wish the other Assassin's Creed games would follow. AC VII: Part 1, AC VII: Part 2, AC VII Part 3, take a 2-3 years break and then come with another Assassin & timeline. A Collector's Edition will also be released for the game.. So, with that Bust being announced, I can stop wasting my time considering if I should get the game or not.. I'm buying this! STGCC 2016 - My thoughts and gaming-related pics!